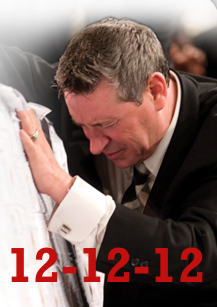 Now that the U.S. and Russian governments have reassured all that the world will not end on December 21, we can focus on a more important and even closer date: 12-12-12. What a lineup! What an occasion! And you won’t get another chance like this for another 100 years! Clearly one would have to be mad to ignore this urgent call to sow a seed and receive the Parsley prayer cloth.Oh, but how much shall you sow? You heard the man, whatever is “the expression of your faith!” “Make your seed the expression of your expectation.” And if you’re stingy with your seed, you’ll only have yourself to blame. After all, God cannot do His part unless your faith first enables Him. You’ll find that “truth” in the Word Faith Heretics Bible, the book of Wolves, Chapter 12, verse 47. Now, as ridiculous as all of this sounds, the fact remains that such fleecing of the sheep is happening. This is real. People are sending their money to Rod Parsley in the hopes that God will finally decide to bless them, perhaps through this specially “anointed” prayer cloth. It behooves us, then, to remember a very important reality, and that is that Rod Parsley is highly admired and revered by evangelicalism’s favorite young, superstar pastor, Steven Furtick. 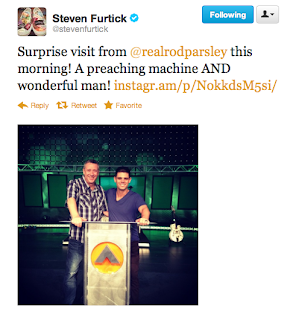 We already know that Furtick has been mainstreamed and is largely accepted within the visible church. This began to culminate when men like James MacDonald of Harvest Bible Chapel invited Furtick to fill his pulpit, not to mention Furtick’s appearance at the now infamous Elephant Room. 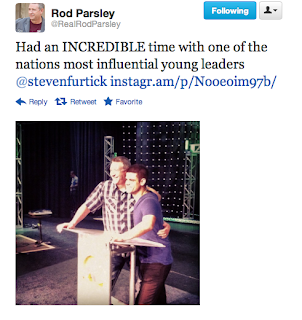 Liberty Universityalso can be thanked for foisting Furtick onto the younger evangelical scene. Of course, it seems that Steven Furtick has spoken at nearly every megachurch imaginable. And when you’re invited to Willow Creek’s Global Leadership Summit and the Hillsong Conference, then you know you’ve made it big.